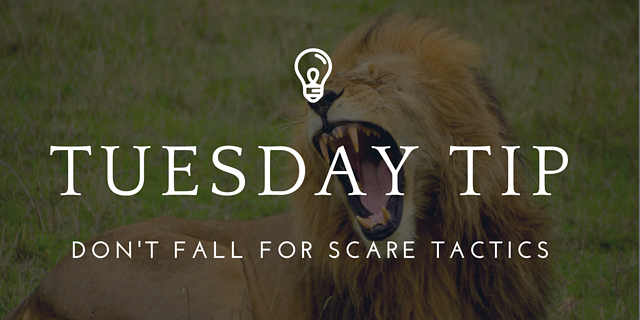 Tuesday Tip: Don't fall for the scare tactic SEO email. Find a quality SEO agency. ArcStone's co-founder and VP of Marketing, Lisa, noticed a common trend amongst our clients, and decided it'd be wise to warn us all about it. A common sales tactic for SEO tools is to instill a fear in website managers so that they think they need the help of the tool. Some of these emails are more threatening than others – some may even state that your site is at risk. Here's Lisa's take for this week's Tuesday Tip on why you shouldn't immediately fall for an SEO sales email and how you can find a quality SEO agency. The majority of the time, these claims aren’t verified or accurate. In fact, most times the people behind the email haven’t even looked at your website, let alone audited it. So, why do SEO agencies use this technique? That’s simple. It works. This tried-and-true technique creates fear around something that is already confusing for most people and causes them to blindly trust someone who promises an easy answer. To understand why this works, let’s take a look at how SEO has evolved. When SEO first became a discipline, some less-ethical people quickly found ways to game search engines and hang an “open for business” sign – even while risking a penalty from Google. They used "black-hat” techniques that may have worked (at least in the short term). While the details that this email points out – broken links, pages that return errors, images without ALT text, pages without metadata – are all valid and influential to search rankings, sending an email like this is simply a way for slippery SEO agencies to exploit website owners and scare them into a fast buck. Follow these 5 tips for selecting a reputable SEO agency. Goals: If an SEO agency promises #1 organic rankings overnight, they’re not being honest or realistic with you. Look for an SEO agency that sets realistic, measurable goals and is honest with you. Modern SEO Strategies and Best Practices: Make sure that the agency you choose, stays current. They should be aware of algorithm updates and changes in the industry and they shouldn't use any black-hat SEO tactics that may end up damaging your brand or reputation. SEO Lists: Be cautious of choosing an SEO agency because they were voted “Top SEO Expert” by an organization that you’ve never heard of. These are often paid listings and require no real skills or experience. Google Partner Certification: Look for the Google Partner badge on their site. This ensures that the agency is staying in touch with digital marketing tools and has an understanding of Google Analytics. Trust, Transparency and Communication Style: A reputable SEO agency will answer your questions and be straightforward. They won’t play games or try to trick you into an SEO program. They will always try to meet or exceed your expectations. Make sure the SEO agency you choose understands your organization and takes time to listen. The next time you receive an email that attempts to scare you into an SEO campaign, do yourself a favor and hit the delete key. If you need SEO help, there are plenty of reputable agencies who will help you set and attain your website goals.